Though we all had them at one point or another, most of us can’t remember the pertinent details of our baby teeth. Rest assured, a review of a few key information points will give you all you need to know to take care of your little one’s new teeth, and hygiene routine. Baby teeth, or a child’s first set of teeth (deciduous teeth) are a very important stage in a child’s dental development process, and assists with the ability of a young child to not only chew food, but also to smile and to speak properly and clearly. These smaller teeth also reserve space for future teeth and ensure proper jaw development for the permanent (primary) teeth that will emerge several years following. The actual development of a child’s first set of teeth begins in the pre birth, embryonic stage, (at approximately six weeks). The teeth then erupt and begin to visibly show in a young child’s mouth during the infant stage. This first set of teeth emerge in four major quadrants of five teeth each, for a total of twenty teeth. When these teeth do emerge in a young infant, the first of them to be seen are typically mandibular centrals (center teeth), which are followed by maxillary secondary molars (rear teeth). These teeth customarily last from the infant stage until approximately six years of age, at which point permanent teeth begin to emerge. How should I care for my child’s baby teeth? Though it may seem a bit sensitive, you can begin brushing your child’s teeth as soon as they come through. Be sure to use a toothbrush that is specifically designed for infants. For babies and toddlers, use a small smear of toothpaste. For children between the ages of three and six years old, a pea sized dollop of toothpaste can used. Brushing in small gentle circles has proven to be most effective for young children. Excellent baby dental hygiene includes brushing twice a day, and teaching your child to brush for themselves, as they get older. 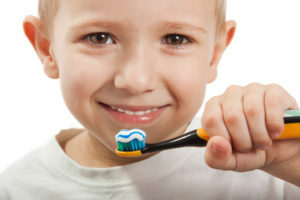 Don’t forget to regularly replace your child’s toothbrush when it gets worn. You should also begin taking your child to the dentist anywhere between six months to one year of age. With a little bit of vigilance and care you can encourage a lifetime of healthy teeth and gums by getting your little one started on an effective dental hygiene regimen from day one. ← Top 7 Dental Health No No’s!